Five Days Until #ValiantSummit 2017 – Streaming Live on Hyper RPG on Monday, April 17th! 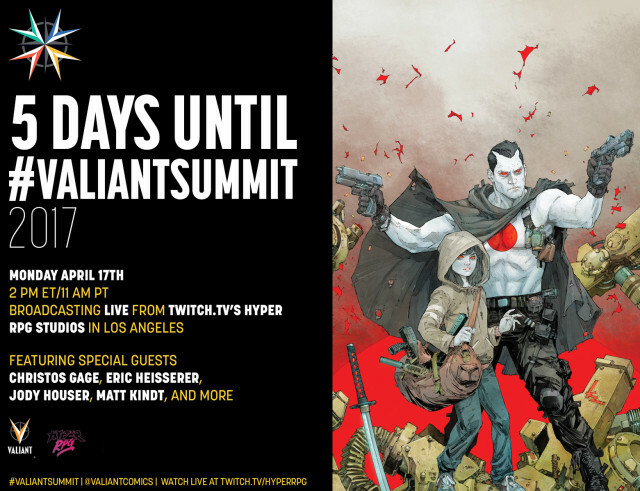 ONLY FIVE DAYS UNTIL #VALIANTSUMMIT 2017 – a massive slate of news and announcements on Monday, April 17th, broadcasting live from Twitch TV’s Hyper RPGstudios in Los Angeles, CA with creators Christos Gage, Eric Heisserer, Jody Houser, Matt Kindt, and more! Follow all of #ValiantSummit 2017′s news and announcements as they happen with a livestream on Twitch TV’s Hyper RPG channel, Facebook Live or Twitter Join the conversation on Twitter at the official @ValiantComics account or follow along with coverage live from #ValiantSummit 2017 from the leading press outlets in comics today!